Big Discounts, Raffle Prizes and Lively Performances at Super 8 Funfest 2014! Grocery shopping can be so much fun if you’re getting huge discounts and raffle prizes and if you’re seeing exciting performances and celebrity appearances. These and more await you at Super 8 Funfest 2014 happening at the World Trade Center from March 20 to 22, 2014. This is the annual sale event organized by Super 8 Grocery Warehouse. Funfest 2014 is Super 8’s way of engaging their customers with quality products at competitive prices. 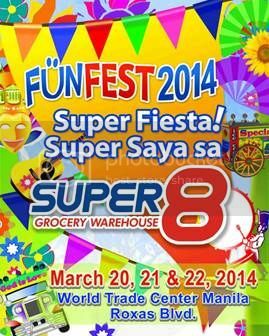 This entry was posted in Press Release, Super 8 Funfest 2014, Super 8 Grocery Warehouse, World Trade Center. Bookmark the permalink.